Wording for the top. Please include if you want it to say Notes etc on it. Jill Smith, Jill Smith's Notes, Jill Smiths Musings, A note from the desk of Jill Smith. Wording will appear exactly as provided. Add quotes in notes to seller. Perfect for the Potter Fan in your life. 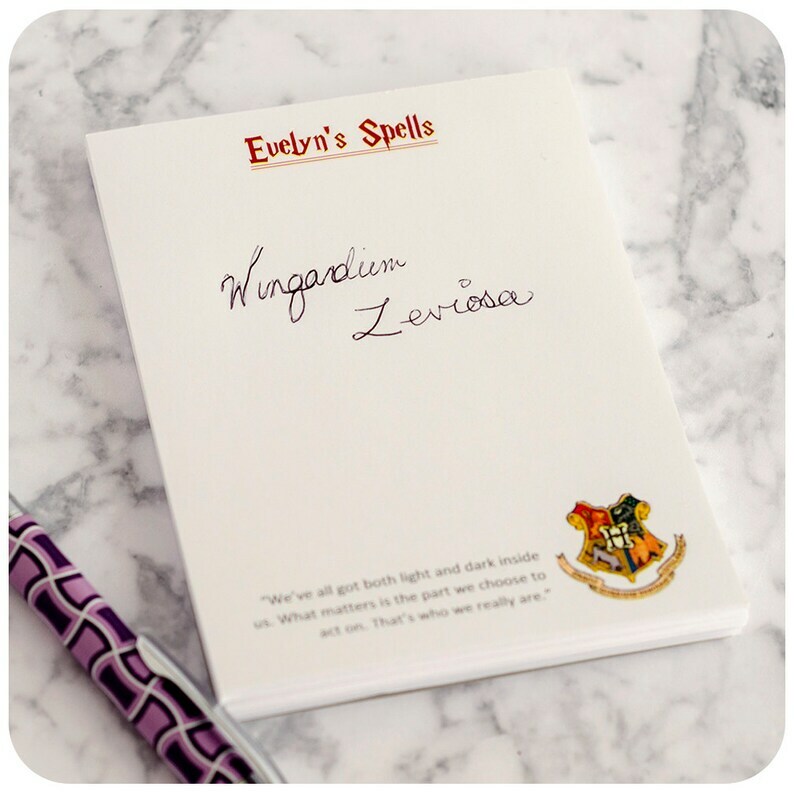 This Harry Potter Hogwarts Sheild Note pad personalized with your (or your friends) first name and up to 6 different quotes on the bottom. Choice of name colours and quotes (6)! Made using 24lb bond paper with either 50 or 100 pages. Page Size quarter page 4.25" wide by 5.5" high or half page 5.5" x 8.5". Includes a coordinating card stock backing. 3. Your 6 quotes, listed clearly and separately and spelled as you wish it to appear. You can pick from my provided quotes or use your own (up to 6 per pad). They will be collated when printed. I can do any quote you like, please leave it in the Notes to seller being sure to spell correctly. Please try and select shorter quotes, I can do whatever length you like, but it will affect how much of the page is taken up by it. 7. "It takes a great deal of bravery to stand up to our enemies, but just as much to stand up to our friends." 10. Happiness can be found, even in the darkest of times, if one only remembers to turn on the light. 11. It does not do to dwell on dreams and forget to live. 15. "Not to be rude or anything, but this isn't really a great time for me to have a House Elf in my bedroom." 16. I know why! You betrayed my parents! You're the reason they're dead! 17. I solemnly swear that I am up to no good. 18. "Give it here, Malfoy, or I'll knock you off your broom!" The quote will appear as it does in the photos in small font in dark grey to be discrete yet present. Depending on length of quote it will appear on one, two or three lines. Please include the desired customization in the notes to seller. If no customization details are given Potter's Spells will be on the top and randomly selected quotes used. Colours available are any under the rainbow. Obviously reaching a specific colour is very difficult, but a colour with a general description is good. IE sky blue, cobalt blue, etc. or for the guys out there that would be light blue and dark blue. Item showed up exactly as I asked. Looks great! Thank you! Perfect!! Ordering more in the future! !